The Vator Accessories, Inc. Modular Pit ladder is the most versatile pit ladder on the market. Each ladder is equipped with a fully adjustable bottom section that allows you to control the height of each leg seperately up to one full foot. This means if there is a variance in the elevation ofthe pit floor, each leg of the Vator modular Pit ladder can be adjusted in height in order to have the most secure installation possible. User friendly, assembles in minutes. Meets A17.1 code. The Vator Accessories, Inc. Modular Pit ladder is the most versatile pit ladder on the market. Each ladder is equipped with a fully adjustable bottom section that allows you to control the height of each leg separately up to one full foot. This means if there is a variance in the elevation of the pit floor, each leg of the Vator Modular Pit Ladder can be adjusted in height in order to have the most secure installation possible. User friendly, assembles in minutes. Meets A17.1 code. * Modular Pit Ladders are available from 7 feet through 17 feet (for 3 foot through 13 foot pits) and each ladder is fully adjustable up to one foot on each leg. For example, one leg can be adjusted to 8'0 and the other to 8'1 to compensate for an elevation in the floor. * Floor mounting brackets are fully adjustable and allow you to control the height of each leg separately up to one full foot! * Reversible wall mounting brackets allow pit ladder to be installed with either 5 or 7 of wall clearance, meeting A17.1 code requirements. * Ships disassembled in max. 48 sections for substantial freight savings (see picture below). 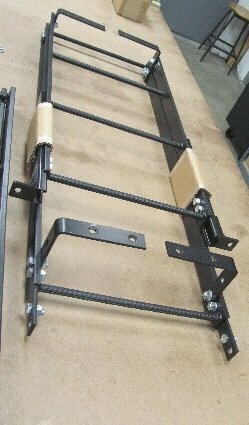 All required splice plates, nuts, and bolts are included for quick and easy assembly. * Upon request ladder can ship fully assembled via truck. *New Option* Now available with standard Top Grab Section (one rung at the top for a grab handle) or Full Rungs extending the entire length of the ladder.